Coverage is limited to defects in materials and workmanship. Refer to the Core Homes Homeowner’s Manual for full details and limitations on coverage. 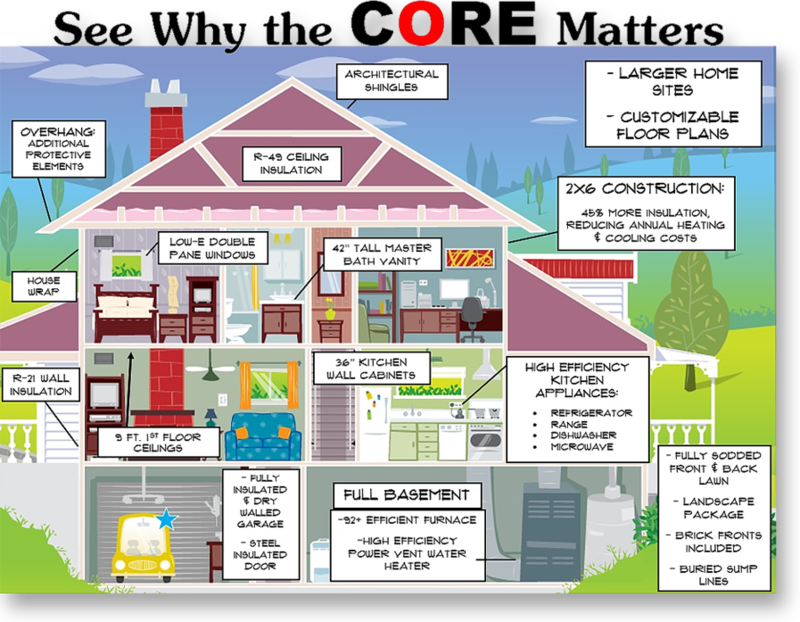 Items covered under manufacturer or supplier warranty are not specifically covered by Core Homes. However, for the first year, we’ll assist you in obtaining service if you are unable to do so directly with the supplier or manufacturer. At Core, we adhere to our Core Values in every home we build. By building with Core Homes, you can expect the highest standard of ethics, fair competitive pricing, the highest standard of quality, a professional attitude, and outstanding customer service. At Core Homes, you can be sure that you are not only getting the home of your dreams, but a home with the highest quality features, because all of our homes are backed up by the Core Advantage. The Core Advantage provides our buyers with quality construction, energy efficiency, top of the line features, along with the best value. In short, our standards are other builders’ options. The Core Advantage can be seen from the beginning stages of home selection, by allowing our buyers the opportunity to customize and modify their home to meet their family’s needs, and goes through the end of the building process with our outstanding home warranties and service department. At Core, our customer service follows you through every stage of construction, to ensure you understand your new home and are an integral part of the process. We offer many opportunities for you to tour your new home throughout the building process, allowing us to keep the lines of communication open and ensuring your satisfaction with every aspect of your home. As you will see, our standard features go above and beyond what other builders in the area offer. The Core Advantage strives to give the highest standard features and building codes, which is why we continually monitor building trends and the latest technology to give you the most energy efficient, high quality home possible, to ensure your home lasts a lifetime.